The Sovereign Debt Crisis that began to show its head in Europe is demonstrating that socialism just does not work. The whole idea of a central managed state and highly regulated pro-worker policy has reduced job growth and exploited labor to such an extent with taxes that the euro countries can no longer fulfill their social obligations. The latest numbers are stunning with 123 million people are now driven into poverty out of 739 million or 16%, and this includes 800,000 children. They are the first victims of an irresponsible policy that has made the preservation of power over the social contract more important than the results. Government CONSUMES the national wealth, it does not create wealth. The bigger the government the lower the economic growth and the greater the poverty of the whole. The austerity measures inspired by a Germany obsessed with the inflation of the 1920s to tackle the Sovereign Debt Crisis by trying to restore confidence in government debt has led to long-term unemployment, low wages and tax increases that have driven more people into poverty in Europe in the shortest amount of time in history. As to the social security systems have been progressively dismantled, one in four Europeans has become poor and this is now seriously affecting socially disadvantaged and children while sending unemployment among the youth (25 and younger) over 60% denying their very future. This is the result concluded interesting enough from unions in the International Labour Organization in its latest report on social security. Europe’s fiscal policy objectives have been based upon austerity to firm up confidence in government bonds. But in fact, the policies are undermining the economy to such an extent that they are destroying future jobs faster than even the low birth rates and Europe is headed into the abyss of economic ruin. The federalization of Europe now has the EU Commission struggling against the Invisible Hand of Adam Smith exerting their own self-interest to retain their jobs at the expense of all of Europe. France is the worst of the lot and now money from the EU given to France for agriculture has been exposed as being diverted and the EU Commission is now demanding France repay the money. The corruption is just too widespread and the politicians are too concerned about retaining power to address the issues. The European civilization of socialism that dominated Continent is on the verge of total collapse. The dream that a federalized Europe would reduce the risk of war has only driven everything into finger-pointing and blaming external forces for current economic decline. 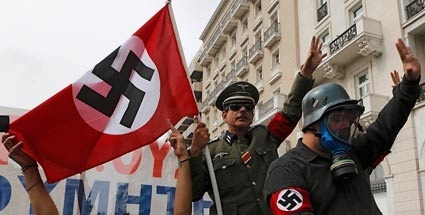 Greek protesters dress up as German Nazis to protest austerity illustrates the division and resentment that is brewing.